Dr. Ray Muzyka is the Group General Manager of BioWare and a Senior Vice President of BioWare’s parent company, Electronic Arts. The BioWare Group within EA has studios in Edmonton (Alberta, Canada), Austin (Texas), Montreal (Quebec, Canada), as well as BioWare Mythic based in Fairfax (Virginia) and the recently announced Galway (Ireland) office. 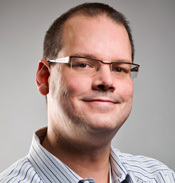 Muzyka co-founded the award-winning development studio BioWare in 1995 with Dr. Greg Zeschuk. Muzyka and Zeschuk operated BioWare successfully for 10+ years, leading to a private equity investment by Elevation Partners in 2005. In 2008, BioWare was acquired by Electronic Arts. BioWare, respected industry-wide for its emotionally engaging and detailed cinematic games, is responsible for such games as the Baldur’s Gate series, Neverwinter Nights, MDK2, Star Wars: Knights of the Old Republic, Jade Empire, Mass Effect, Sonic Chronicles: The Dark Brotherhood, Dragon Age: Origins and Mass Effect 2. Among other projects, BioWare is currently developing Dragon Age 2, as well as the third episode in the Mass Effect trilogy, Mass Effect 3, and the highly anticipated massively multiplayer online role-playing game, Star Wars: The Old Republic. Muzyka completed his MD at the University of Alberta and his MBA program at the Ivey School of Business, University of Western Ontario. He also serves as a Director and Co-Chairman of CodeBaby Corp. (www.codebaby.com), a software company developing a next generation interface for digital media and the Internet. In addition, Muzyka is an avid poker enthusiast, having successfully competed in numerous notable poker events including winning the 2006 and 2010 D.I.C.E. Summit Celebrity Poker Tournaments and the 2008 WCPC Main Event (Western Canadian Poker Tour, $1600 buy-in Main Event). Most recently, Ray finished in the money (top 400) out of nearly 7500 international players in the 2010 World Series of Poker $10K entry Main Event, where the total prize pool was $68,798,600. .
Join the BioWare community and learn more about its products at www.bioware.com and the BioWare Social Network at social.bioware.com.